Wash hair with Brazilian Blowout Volume Shampoo & Conditioner. 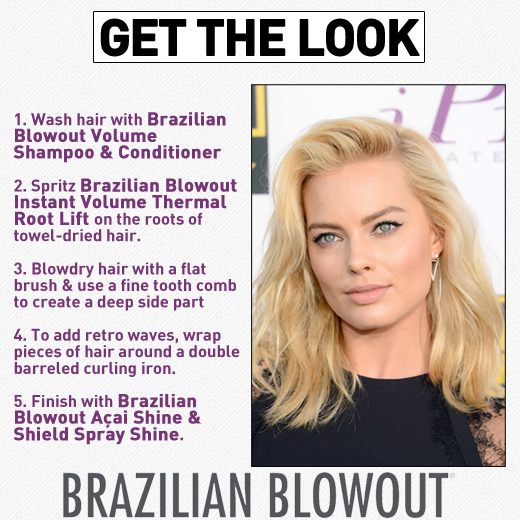 Spritz Brazilian Blowout Instant Volume Thermal Root Lift on roots of towel dried hair. Blowdry hair with a flat brush and use a fine tooth comb to create a deep side part. To add retro waves, wrap pieces of hair around a double barreled curling iron. Finish with Brazilian Blowout Acai Shine & Shield Spray Shine.